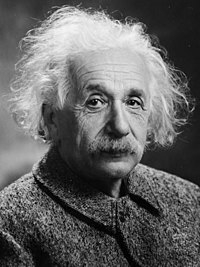 Albert Einstein (March 14, 1879 – April 18, 1955) was a German-born Swiss-American physicist. "A happy man is too satisfied with the present to dwell too much on the future." Simple: A happy man is so happy about things that are happening now that he does not worry much about the future. Simple: Energy equals mass times the speed of light times the speed of light. What it means: If a thing gives off energy in radiation (light and radio waves and things like that) then its mass gets smaller by an amount equal to the amount of energy given off divided by the speed of light and then divided by the speed of light again -- usually a very small amount. "It followed from the special theory of relativity that mass and energy are both but different manifestations of the same thing — a somewhat unfamiliar conception for the average mind. Furthermore, the equation E = mc², in which energy is put equal to mass, multiplied by the square of the velocity of light, showed that very small amounts of mass may be converted into a very large amount of energy and vice versa. The mass and energy were in fact equivalent, according to the formula mentioned before. This was demonstrated by Cockcroft and Walton in 1932, experimentally." Simple: If the ideas about Special Relativity are true, then mass and energy just different ways of seeing the same thing -- something hard for most people to understand. Also, the equation E = mc², where energy is equal to mass times the speed of light times the speed of light, shows that very small amounts of mass can be turned into large amounts of energy, and large amounts of energy can be turned into very small amounts of mass. The equation said that mass and energy really had equal value. Cockcroft and Walton did an experiment to show that this is true. "Things should be made as simple as possible, but not simpler." What it means: Do not try to make things too easy to understand, or you may change what it means. ↑ Neoplastic Hematopathology, Google Books. This page was last edited on 26 October 2009, at 03:42.